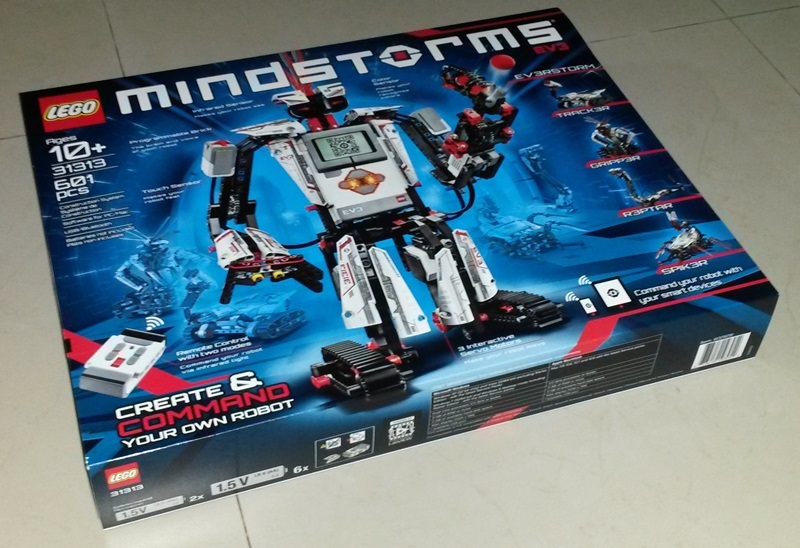 The Lego Mindstorms EV3 comes as a box of Lego building blocks, motors, sensors and a mini computer called the EV3 brick into which other parts are wired into. Today we built our first robot called TRACK3R which was pretty straightforward. We simply followed the assembly instructions in the booklet that came with the kit. You can download the plans for many more robots from the Lego Mindstorms web site. If you don’t like working with PDF files, Lego also has an iOS app called LEGO MINDSTROMS 3D Builder that is built using Autodesk Inventor Publisher technology. 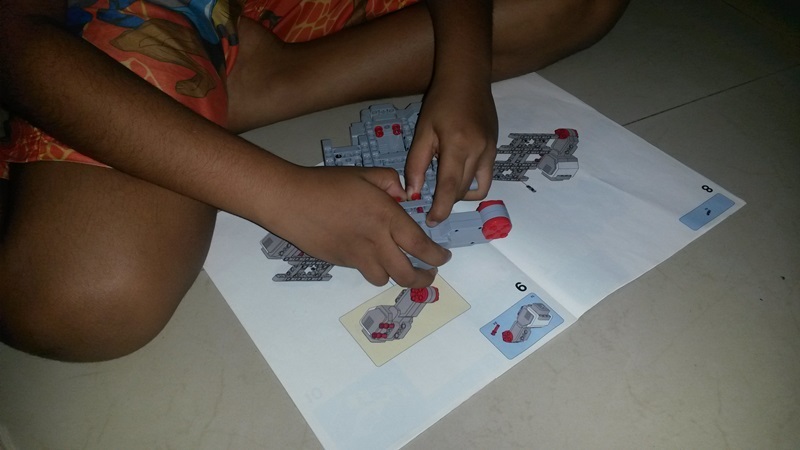 After assembling a robot you need to program it to do something, which can be a little overwhelming for a kid. Lego has done an excellent job dumbing it down to a point where a kid can visually program the EV3 brick. This is done using a easy to use EV3 Software which runs on Windows and Mac. This is what simple program looks like. Each of the green blocks represents an action. The first green block after the orange start indicator tells the EV3 brick to display an image on the EV3 screen. The next one tells the motors B and C to move two rotations. You don’t write a single line of code. All you do is edit the parameters right in the block itself. The next block tells the EV3 brick to rotate a third motor two rotations. The block after that moves the motor B and C backwards by two rotations getting the robot back to its original position. Finally the last block tells the EV3 brick to play a sound to end the program. You can add new blocks to the end of the program or insert them in between using simple mouse drag and drop. You can even put these blocks in loops so that they continue indefinitely, exit when a sensor reports back something, etc. You can even have the program wait for something to tell it to proceed, abort, etc. After you create an EV3 program using the EV3 software you download it to the EV3 brick via a USB cable or you can also do it through WiFi or Bluetooth. Today we didn’t get into programming the robot. We downloaded a few sample programs for the TRACK3R from the Lego site and downloaded them to the EV3 brick. Here is a video of the TRACK3R running one of the sample programs.